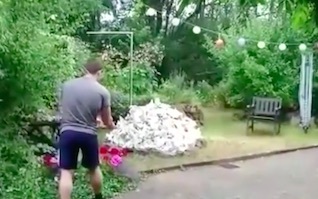 A guy has caused a pretty huge explosion in his own back garden after throwing lit candles onto a pile of rubbish soaked in, well, something highly-flammable. Footage of the incident posted online shows the guy lighting the candles and nervously – and it turns out, knowingly – approaching the rubbish, reports The Mirror. 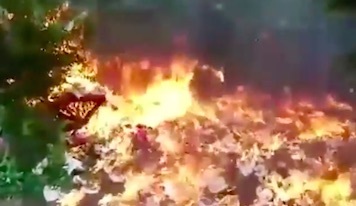 Fortunately he decides to take a couple of steps back before igniting the giant mound of what looks like crumpled paper as what happened next was way more violent than anyone was expecting. The mound explodes with a massive boom, rattling windows and sending the woman behind the camera running inside for cover. When she re-emerges from the house where once was a pretty nice looking garden is now a sort of post apocalyptic furnace complete with piles of flaming paper and a few burning trees. She tells the man to douse the fire with water and they discuss whether they should call emergency officials for help. The footage was posted to YouTube and Reddit – where it has been watched over 250,000 times – with the vast majority of people condemning the stunt.